A quick little video of our Scent Specific Tracking demo Suzanne & K9 Levi did on 7.27.18 for the New England Animal Control/Humaine Academy @UNH. Thanks to all to followed along- it was HOT out! 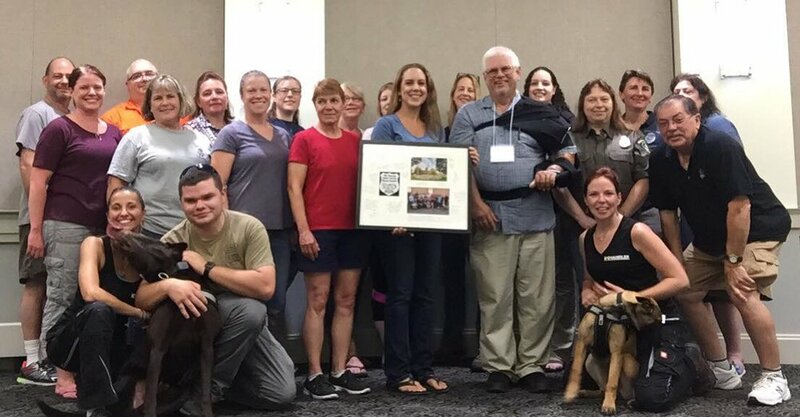 It was an HONOR to be asked by the New England Animal Control/Humaine Academy to educate an amazing group of professionals about the use of K9s aiding in the search for missing and lost pets. LPTD was welcomed with such hospitality while we discussed: our methods of K9 training/tracking/temperature and human interference regarding scent/client and professional organization’s hopes and expectations/false and/or misguided information regarding tracking dogs/etc. An in class demonstration of decomposition “cadaver” finds was performed by 18 week old Belgian Malinois, K9 (In Training) Halo 😇 & Handler Lisa and an outdoor 1 week old scent specific trail was tracked by our chocolate lab, K9 Levi & Handler Suzanne. At a successful day we will never forget, a huge THANK YOU to all who attended and for the love and support of this team tracking forward! K9 on the Front Line 6/2018 - Pictures of Suzanne Davidson & Janis Nazarenko attending the event on behalf of LPTD. To all kitty and animal lovers... January 20, 2018 info session at Flight Deck Brewing in Brunswick, Maine & to Out of State (Maine) Peeps, (Facebook Live) for an informal session discussing everything you want to know about how our K9s are used to help find missing pets! We cover the Northeast & beyond (plus we know some really awesome folks all over the US so we can help just about anyone). Hoping you never find yourself in a situation that would require our team, however - you can tune in for some tips and questions on how to NOT be that heartbreaking phone call. Of course, should it ever happen - we're here to help! 3 K9 Handlers of LPTD clean up for a charitable evening benefiting Toys For Tots!